This small, compact dinosaur was built for speed and agility. While Coelophysis stood only about seven feet tall, its powerful rear legs and long slender body made it a fast and deadly predator. It had a long narrow head and a mouth filled with numerous razor-edged teeth. Unlike other dinosaurs, the leg bones of Coelophysis were nearly hollow, which helped reduce its total body weight and increase its speed. In 1947, dozens of Coelophysis skeletons were found in a mass grave in New Mexico, which has led many scientists to believe that these dinosaurs hunted in large packs. Strangely, at the same location, some adult Coelophysises contained the skeletons of their young. At first this was thought to be proof that they may have given birth to live young rather than laying eggs like other dinosaurs. 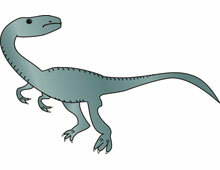 But now it is believed that Coelophysis was probably a cannibal that occasionally ate its own offspring.